We like GoodReader for a PDF consuming tool here at AppleInsider. At present, the GoodReader file repository is stored in the app, and not visible by the Files app at present. This may change in an update to the venerable utility -- but that's up to the developer. Why not? Drop the files into iCloud Drive on the Mac or Windows (using the web interface) and see and enjoy them in the Files app on the iPad or iPhone. If you don’t want to use iCloud, there is a lot of file / download utilities on iOS that accept files under WebDAV from the computer. No chmod, no vi, no sed, no AWK! I can’t even write a shell script to back up our company’s thousand-server cloud farm onto my iPhone! Pah! Call this a mobile operating system?? …thought we’d just get that out of the way first. Other than setting up a macOS Server install, there is no way to move a file from macOS to iOS other than using iCloud, Amazon Drive, DropBox, or some other service across the internet, rather than keeping the file on the local area network. A little misleading here as you can easily use Airdrop to accomplish this and keep the file within your local area network. It would be nice to see support for connecting to standard file servers added in though. I have Dropbox app installed and am signed in and it doesn't show up as a Location in Files. I don’t want them taking up iCloud space plus as far as I know 3rd party video apps can’t import from iCloud Drive. Did you go to "Edit" in the top right corner? Some have to be toggled on. I had to toggle on Drive. Still no local file storage option. 512gb on an iPad Pro should be able to be utilized for LFS. That is a limitation of that application. At least they must accept files shared via the Sharing panel. The file is initially stored in the download app's own repository. You tap the Share button and transfer it to the 3d party video app. If that 3d party video app does not appear there, then this is not the fault of iOS nor the initial download application. Use Infuse. It accepts files from many venues. Looks good, but it doesn’t seem like a DropBox replacement at first blush. Please correct me if I’m wrong. One thing I noticed about "On my iPhone/iPad" is that you can't save files to the main level, and you can't create or rename folders. You can only put things in a folder for an existing app. For example, I wanted to save some web images to "On my iPhone/iPad", but I had to choose an existing app's folder (I chose "Pages") to drop those files into. It is a new folder, not the same "Pages" folder that is on my iCloud Drive. 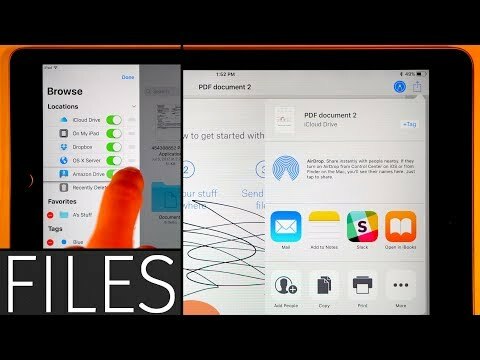 I hope Apple will create an update for iOS 11 that will allow users to put files into "On my iPhone/iPad" at the top level, or to create and name their own folders. That won't happen. There is no centralized document repository in iOS as one of its main differences from desktop operating systems. in iOS only apps have document repositories. If you need a centralized document repository in iOS then this is the iCloud Drive. External drives provide their own apps, from there you can copy to iCloud Drive or other app repositories. Wireless drives work through their own apps. There is NO wired external hard drive support. Documents 6 works easier than Files.app for a direct drag and drop transfer, although Sandisk is now in Files.app. I would guess others (like WD) will soon show up there. Never say "never". All Apple would have to do is allow Files.app the same privileges to store files locally as any other app that currently does. They should move in this direction. Constantly re-downloading files (often at great expense over LTE) keeps iPad from being a pro level laptop replacement. my main issue is to see if Files App will interact with external drives.. and act as a consolidated centralized file managment sys. If i have to use other apps to get the task done the whole purpose is defeated. Thanks for the pointers though ! OK.... I can live with that. .... Sort a simplified or bare bones file system. Added: Thinking that through, it makes a LOT of sense. I have seen some of the biggest confusion among non-computer savvy people is around files vs programs -- and how they all relate (or not!) with each other. Setting up a table in MS-WORD for a friend last night, he seemed to believe the only way to get to the file was to open WORD and then look for "recent". I mentioned that there were other ways, but didn't go into detail. It just wasn't worth it. He was able to do what he needed to do.